The house at 124 W. Main Street has three bays with a side entrance. Folding panel shutters flank the three second story windows on the front of the house. These windows are one over one sash with plain frames. There are also two one over one-sash windows on each floor of the original brick structure. Paneled shutters flank these four windows. A small single pane fixed window for the attic is located at the gable end. There is only a single pane fixed attic window at the west side of the house. A plain transom with three horizontal lights tops the front door. A new glass outer door protects the fancier Italianate wooden door that leads into the front hallway. The brick on the portion of the house that faces the street is the fancier Flemish bond. The sides of the house, however, are regular American bond. According to neighbors the brick was its original color for most of the house's existence but was then painted white. The porch that wraps around to the east side of the house has a shed roof that is covered by synthetic shingles. Turned posts with Italianate brackets hold up the porch roof. The handrail is simple and displays plain balusters. The house appears to have originally been a two-story brick structure with one room, a hall and stairs leading to the second floor. The main room on the first floor is to the left as you enter the house through the front door. The trim around the doorways and windows is fairly simple and seems to be consistent with the early 19th century. The staircase is wooden and narrow which is characteristic of older homes. Currently, there are two bedrooms on the second floor of the original building. It is possible the second floor was originally one large room. The bedroom to the left is the smaller of the two but also has the door that leads to the attic. When in this attic stairway you can view the lath and horsehair plaster that was used in the construction of the house. The original part of the attic is small with a low ceiling and currently used for storage. There are no fireplaces in the original house. It is assumed that a stove was used to heat the house. 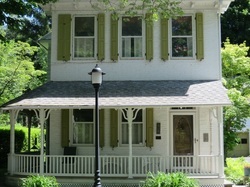 The kitchen is located in the addition from which a door exits onto the porch on the east side. The addition to the house is also two stories and is covered with white siding. The windows on the west side of the house near the chimney are six over six sashes with plain frames. Andrew Stroup sold lot 48 to Philip Moore in 1809. The deed transfer indicates that a two story brick house had been had been erected there prior to 1838. It is thought to be the first brick house constructed west of the Boalsburg diamond. It was sold to R.E. Smith later that year and he lived there until 1840. David Hoover a shoemaker acquired the property in 1840 but died soon thereafter and was inherited by his nephew Henry Hoover. He sold the property to Rev. L.E.Sechrist in 1864 and he lived there until 1867. Later 19th century owners were: Wm. Wagner 1865-71, Wm. Durst 1872-95, and David Sparr 1895-99.